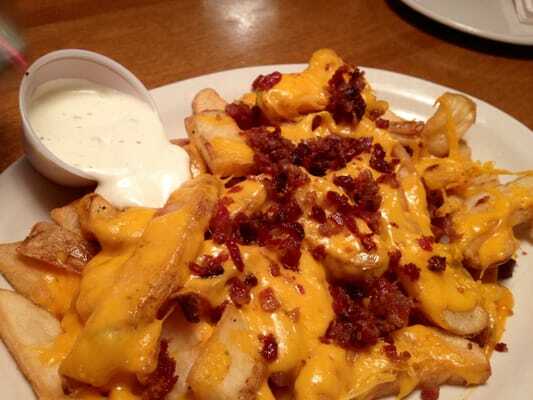 These are wavy cut steak French fries covered with cheese sauce, shredded Cheddar cheese and crumbled bacon. Served with a side of ranch dressing. Arrange the steak fries in a single layer in two greased 15-in. x 10-in. x 1-in. baking pans. Bake at 450 degrees for 15-18 minutes or until tender and golden brown. Meanwhile, in a small saucepan, combine the soup, milk, garlic powder and onion powder; heat through. Drizzle over fries; sprinkle with paprika and crumbled bacon. There is a pepper jack cheese sauce!